14ymedio, Luz Escobar, November 6, 2018 — The campaign against Decree 349, an article in the the proposed new Cuban constitution which includes strict rules on artistic expression in public spaces, has collided with Cuban customs restrictions. Upon her return to the island, artist and activist Yanelys Nuñez reported on social media that customs officials at José Martí International Airport had confiscated eight T-shirts with anti-decree slogans she was bringing from the United States. On Sunday Nuñez and a fellow artist, Luis Manuel Otero Alcántara, returned from a three-day trip to Miami, where they had been participating in an artistic event. The items, which were produced in the United States by Cuban-American designer Coco Fusco and were adorned with an illustration by Alén Lauzán, were seized after customs officials had inspected their baggage. Two of the shirts belonged to Nuñez and the other six to Otero. 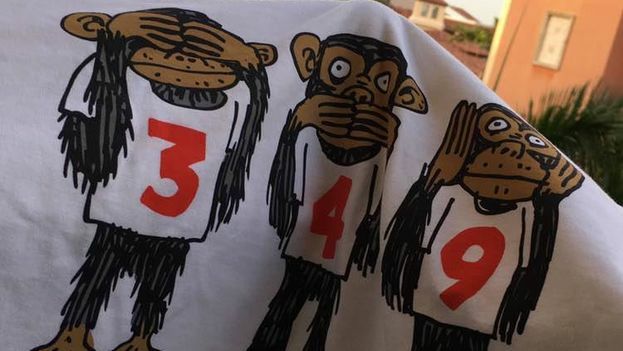 “As soon as they saw ’349,’ they told us it was subversive propaganda,” the activist explained to 14ymedio. She and Otero had travelled to the United States to participate in an event organized by a not-for-profit organization, Creative Time, entitled “On an Island: Defending the Right to Create,” at which they made a presentation critical of Decree 349. The artist has already said she will file suit in Havana to reclaim the two shirts that were confiscated and is currently receiving legal advice. Before boarding their flight to Miami, Nuñez and Otero were detained at the airport while their luggage was being searched. Though authorities did not confiscate anything at the time, the delay caused them to miss their flight on American Airlines. Later that afternoon they were able to catch another flight to Miami on the same airline. The main complaint of those critical of Decree 349 is that, in every case, artists must obtain prior approval from a cultural organization, which they are forced to join, before executing their work. This requirement directly impacts those who create work outside a state-sponsored framework. The result is that the content of their work is subject to regulation. The campaign against Cuba’s Decree 349 is important to Yanelys Núñez because “the government survives on its image.” Her goal is for more artists and cultural institutions to “speak out against this blatant censorship by the Diaz-Canel government.” She plans to continue exerting significant pressure to achieve its repeal.